I had spent the night at Coso Junction along US395 where I was to meet Bob Sumner in the morning. It wasn't the best of spots across the road from the Chevron Station - there were a few too many lights and a few too many trucks that would come and go in the night, but I made due and slept decently. I was up and breakfasted when Bob pulled up in is Jeep Liberty within a minute of the appointed 6:45a meeting. He had driven up from LA and had timed his commute remarkably. 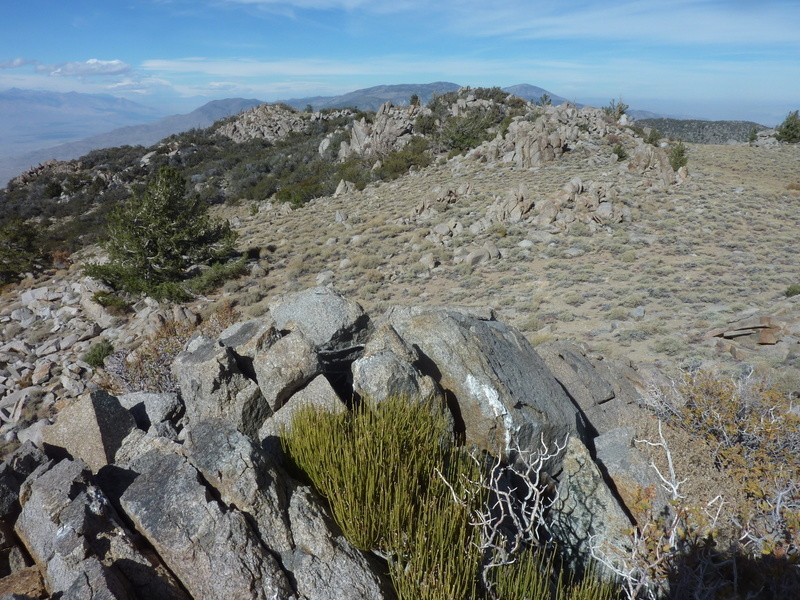 Our goal this morning was the Sacatar Trail Wilderness HP, plural in this case, as there are two summits along the Sierra Crest separated by about a mile that can lay claim to the title. Bob had previously investigated routes from the west at Kennedy Meadows and Nine Mile Canyon Rd, but found private property blocking access to the Wilderness. So our plan this morning was to drive up Lewis Canyon where a 4WD road allows access to 5,000ft. We managed to drive a few miles of this road but it deteriorated to the point where Bob's 2WD Jeep would be seriously challenged if we continued and we might not get back up one sandy, rutted section that stopped us. We could have walked from that point and were about to, when Bob noted that smoke was blowing over the crest from a recent fire in the Southern Sierra. This was going to challenge Bob's asthma and make for pretty crappy views, so we decided to cut our losses and look for something else to do. Back to Coso Junction we went. We looked at a number of options for a good half hour before settling on Peak 10,088ft in the Inyo Mtns. It was the last of the non-Sierra 10,000-foot CA summits that Bob had left to do, a list that had been completed by Paul Garry only six weeks earlier. Bob had thought he had been the first to finish this list some time ago, but the list that appeared on peakbagger.com was incomplete, missing a handful of unnamed peaks in the White and Inyo Mtns. Paul had discovered this, climbed the additional peaks and then submitted the updated list to peakbagger.com. These peakbaggers are tricky fellows. The mileage for the peak was not long, only 7-8mi roundtrip, but would involve 6,000ft of gain. We drove north to Independence where we left my van, then headed east on Mazourka Road in the Liberty. We left this road before it begins climbing up into the range, navigating 3.5mi of minor dirt roads to the south and east to get us to the mouth of Coyote Canyon. A beefier vehicle can drive the additional half mile to Coyote Spring where the road ends, but we would be fine doing this stretch on foot. Because of the time spent in the Sacatar effort, it wasn't until after 9:30a that we started out. The route was not terribly complicated, following a steeply rising ridge once we got to the end of the road. Most of the first two hours were on easy-to-navigate terrain, dry, rock & sand slopes with little vegetation and good footing. Just below the 7,000-foot mark junipers begin to populate the ridgeline, with pines higher up. Along with the trees we found the ridge becoming increasingly rockier with large granite outcrops that provided some scrambling opportunities albeit at a slower pace. We were stopping every hour for about 5min to give Bob an opportunity to eat some food and catch his breath. Getting ahead of him and out of sight during the second hour, I found a rocky perch to stop and wait for Bob who popped up five minutes later, having taken a slightly different path. I repeated this procedure the next hour, but Bob didn't show up at the expected time. Our ridge was curving to the left away from our summit and it was necessary to cross a drainage to stay on the correct heading. I had angled lower through this region and ended up further south than Bob. After concluding we'd missed each other, I started up only to hear Bob's voice call out. I shouted back but couldn't really make out what he was saying and though I had a good spot from which to scan the drainage, I could see no motion that might give away his position. Later he would report not having seen me, either - easy to lose someone among the rock and trees. It was 1:40p when I found my way to the crest of the range and what I thought was the highpoint. Despite having the point accurately marked on my GPSr, I had wandered up to a slightly lower point a few hundred yards to the south. Oops. Six or seven minutes later I found my way to the correct point where MacLeod (sans Lilley) and Sanders had left a register in 1980. The next visitor had been in 1995 after which it went quiet until this year. Greg Gerlach, Paul Garry and now Bob Sumner, all chasing the same 10K peak list. Bob was still nowhere in sight after about ten minutes so I decided to go check out a large cairn I could see a short distance to the northwest. It turned out to be survey cairn, with a benchmark likely buried under the heavy cairn as indicated by a USGS reference mark found pointing to it. This is likely the survey elevation that shows on the 15' topo as two meters lower than the higher point reported on the 7.5' version. For added peakbagging fun, MacLeod had left a register here, too, with a collection of three entries from the 1980s and 90s, different from those at the highpoint. Bob spied me at the cairn location while I was looking around, a bit disappointed when I pointed out the true highpoint further away. He joined me at the second register to add his name, then we returned to the highpoint a few minutes later, around 2:20p. Bob was looking better than I expected after a 6,000-foot climb. The last time we had climbed together was an aborted effort at Thompson Peak in the Trinity Alps after we'd only done 1,000ft. He was certainly in far better condition than that day. We took about 10min to give Bob a chance to eat more food and rest before starting down. To the west we could clearly see the advance guard of a storm system moving in from the west, with threatening clouds piling up along the Sierra Crest. We would keep an eye on this over the remainder of the afternoon but it never became a real concern over here on the east side of the Owens Valley, but we were happy not to be in the Sierra today. Our return would be pretty much along the same lines as the ascent, doing our best to avoid the brushier parts we'd encountered on the way up. About halfway down I paused to examine and photograph some bear tracks I spotted crossing the ridgeline. Bob commented that he heard there were no bears in the Inyos, but clearly that was wrong. Later I did an online search and found that there are varying views, but the USFS seems to have noted an increase in bear activity in the area after two dry winters. It was 4p when we exited the brush and rock section of the route with another hour to go. At the base of the mountain where we picked up the road, we found a small rock charcoal kiln that we had missed on the way up, leftover from some mining activity in decades past. It was not long after 5p when we returned to the car. The sun had vanished behind the advancing storm but there was sufficient daylight for at least another hour.